Aftab Ahmad Blog Why is India Afraid of Dr. Binayak Sen? Why is India Afraid of Dr. Binayak Sen? A child molester is sentenced to a year and a half in jail twenty years after his victim killed herself, and gets out on bail within four months. A man, who is responsible for the continuing suffering of millions of victims 26 years after a gas tragedy, is allowed to lead a cosy life in the United States of America. A man who cost the government lakhs of crores is raided by the CBI after ample notice that would've given him time to get rid of incriminating evidence. A convicted terrorist is fed biriyani, while the hangman finishes up his backlog. Yet, in this very same nation, a human rights activist is almost summarily sentenced to life imprisonment - the maximum penalty for most rapists and murderers. Dr Binayak Sen, it must be remembered, has been hailed across the world and in his own nation for his stellar work in the rural healthcare field. Here is a man who has clearly stated that he doesn't condone Naxalites or approve of their violent methods. Yet, after being initially jailed for more than a year without trial, he has now been convicted, on the basis of an unsigned letter, of waging war against the government. So, what makes this 60-year-old an enemy of the nation? The fact that one of his patients was a Maoist ideologue? Or the efforts of his fact-finding team in exposing the atrocities committed by the Salwa Judum? 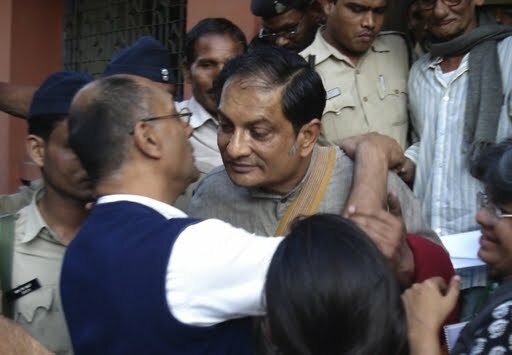 Each one of Dr Sen's 33 visits to Narayan Sanyal in Raipur Jail was carried out with prior police permission. The postcard penned by Sanyal, which was used as evidence to arrest Dr Sen in May 2007, was signed and sealed by the jail authorities. But where were the lawyer and the impartial witness when the state authorities were rifling through Binayak Sen's computer? As one of India's most high-profile criminal lawyers, Ram Jethmalani, 'embarrasses' his party by offering to represent Dr Sen (incidentally, for the second time, after securing his bail in 2009), and the global chorus protesting against the sentence gets louder, the Indian government is beginning to bear an uncanny resemblance to its Eastern neighbour. Chinese human rights activist Liu Xiaobo was in prison, unable to receive news of his winning the Nobel Prize this year. Startlingly reminiscent of Dr Sen's Jonathan Mann Award in 2008, eh? Why is India so scared of people who talk? Take the sedition charge against Arundhati Roy. Frankly, there isn't much she says that I agree with, mostly because her speeches are poorly-researched, vituperative, ambiguous and, sometimes, funny. But that doesn't mean I believe she ought to be arrested and tried, simply for mouthing off the government. What makes an Indian who questions the running of the country less of an Indian citizen than the Prime Minister? Chances are that the 'activist' - oh yes, the word is always within quotes - in question has been a citizen of this country far longer than the Chairperson of the UPA coalition. But in India, there seems to be a rule that one cannot speak against any action of the government unless one is a part of the state machinery. And, it seems, a state agent can get away with anything, including the molestation of a child. How far are we from turning into China or Iran or Sri Lanka, where most political prisoners are journalists and activists, held for criticising the government? How different are we from the Thought Police of George Orwell's 1984? The historical rebellions that took place in this country are considered landmarks in nation building, and their perpetrators eulogised as heroes. Has anyone read of the Revolt of 1857, or the Dandi Salt March, or the Indian National Army, or the Quit India movement, in unflattering terms? Would anyone condemn Mangal Pandey or the Rani of Jhansi or Mohandas Karamchand Gandhi or Subhash Chandra Bose as an enemy of the state? Does the fact that India is now run by Indians make it illegal to speak out against the government? Worse, does daring to defy the government mean one could be sentenced to a life-term in jail, without possibility of bail? If so, our nation is in a perpetual state of Emergency.